This completely remodeled 3 bedroom and 2 bath second-floor condo is the perfect place for your next family vacation. Your private oasis awaits you in the Master suite. It has a plush Queen sized bed and flat screen TV. Start your day the perfect way with a cup of coffee on your private master suite lanai. The adjoining Master bathroom has double sinks and a vanity for all your beauty needs. Step into the luxury shower and let the rain shower head wash away all your stress. The second and third bedrooms have Queen sized beds and flat screen TVs for your family to enjoy. Additionally, there is a queen size sleeper sofa in the living room for extra guests. This completely remodeled unit can sleep up to 8 people and has ample room for your family to spend time together. With central air conditioning and a beautiful kitchen to cook in, you will never want to leave. Equipped with a fully stocked kitchen, free WiFi, free parking, Central A/C, ceiling fans, and stack washer/ dryer, you can enjoy all the amenities of home while relaxing on Maui. 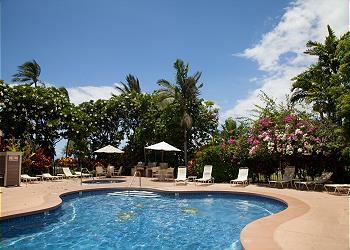 Grand Champions is perfect for families with children, couples, or a group of friends visiting Maui. It's a great condo for those travelers with larger groups who are on island to adventure, get out and see the island! This condo has a fully equipped kitchen with granite counter tops, full size appliances, dishwasher, and a flat screen TV in the living room. Packing for Grand Champions is easy, as we provide our guests: iron, ironing board, hairdryers in all bathrooms, hotel-quality towels and linen, beach towels, and a starter supply including: paper products, trash bags, laundry and dish detergents, soaps and hand soap, shampoo, conditioner and lotion. With two pools and two Jacuzzis on property to enjoy and 4 BBQ gas grills, there is something for everyone to enjoy! Ready to explore the area? Step just outside the resort and play at match at the award winning Wailea Tennis Club. Try your hand at a round of golf at one of 3 championship courses at the Wailea Golf Club. Or head over to Gateway Shops or the Shops at Wailea located within walking distance and experience the incredible shops Wailea has to offer. Be sure to bring your family to Wailea Beach, just a short drive or a 15-20-minute walk away, for a day you won’t soon forget. A stay at Grand Champions will create memories you will cherish for a lifetime.